The stage is all set for the biggest game show Ningalkkum Akam Kodeeswaran, the most popular TV game show in Asianet. 'Ningalkkum Akam Kodeeswaran Season 3' is back with interesting changes. Prior to the new season, the host actor Suresh Gopi will be asking questions to find the new participants. Adopted from the world famous game show 'You can be a millionaire', NAK has already successfully completed its 2 editions. Produced by BIG Synergy Media Limited, the show will be launched during the last quarter of 2014. Participation is strictly based on audition and fixed rules. Eligible registrants will be called for an audition to be conducted in 4 zones like Calicut, Cochin, Trivandrum and rest of India. Questions will be aired at 6:30 PM every day, staring from 30th October 2014. Those who wish to be a part of the audition of the game show can answer the questions asked during the 30th October – 5th November 2014. Answers can be sending in the given format. NAKA/B/C/D should be send to 57827. For BSNL Landline users, the format is as follows. Idea users must have to send their answers in the following format. Eligible candidates must undergo an audition test which will be the stepping stone to make up into the final list of participants. Various rounds like 'Audience Poll', 'Phone a Friend' and 'Fifty-Fifty (50/50)' would be arranged as per the rules. Shyla C.K. from Idukki, made history by being the first person to win 50 lakhs during the 1st Season of the show. Sanooja Rajan was declared as the first Crorepati of the Season 2. Suraj Venjaramoodu, Kavya Madhavan, Samvrutha Sunil, K. S. Chithra, Shwetha Menon, Madhu were few among the Celebrities who were a part of two season. Do you want to participate in Asianet Ningalikkum Akaam Kodeeshwaran game show? Here are the details about how to register and participate in the game show in Asianet ‘Ningalikum Akaam Kodeeshwaran’ hosted by Suresh Gopi. Get full details about the program and participate in with pride and courage. Asianet Ningalkkum Akam Kodeeswaran question No.1, question No.2,question No.3,question No.4,question No.5,question No.6,question No.7,question No.8 of January 28 -February 4 2012 is given here. 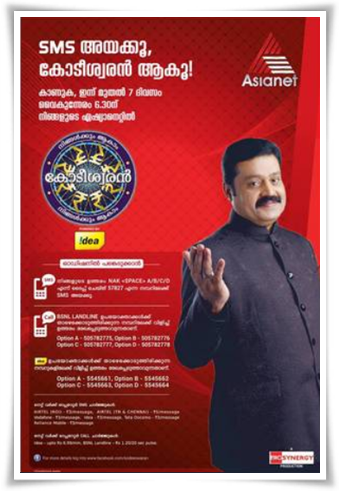 If you wish to participate in Asianet ‘Ningalikkum Akaam Kodeeshwaran’ game show hosted by Suresh Gopi, do get the full details about the program and do participate in this mega game show offering prize money of Rs. 1 crore. How to participate in kayil oru kodi are you ready in surya tv? Kayyil Oru Kodi is an upcoming game show to be telecast soon in Surya TV. The anchor of Kayyil Oru Kodi will be Mamta Mohandas, one of the leading actress in Malayalam. If you want to know how to participate in Kayyil Oru Kodi and win 1 crore Rupees, read more in this article. This mega game show would be the best ever show to be telecasted in Surya TV. Ningalkum Akam Kodeeswaran is a quiz based game show that is showed in the most popular channel Asianet. Watch this game show to earn some good general knowledge. Read this article to get a glimpse to Ninglkum akam Kodeeswaran. The article also discuss the rules and regulation of this program.